BIG SALE FROM MAH JONGG MENTOR! 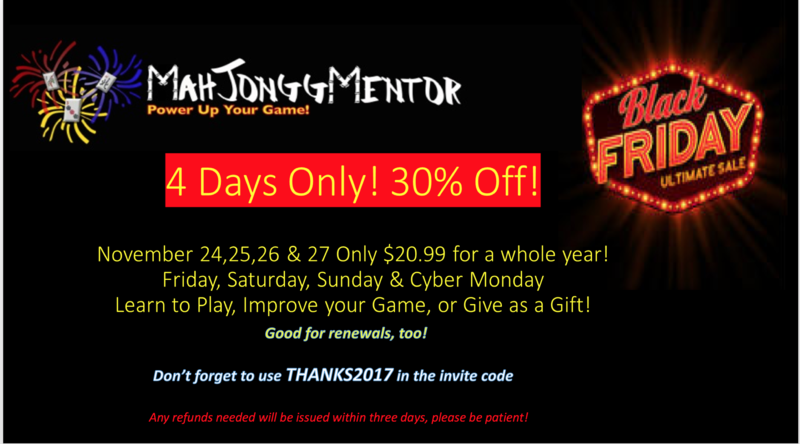 Four days only – MahJongg Mentor is offering a 30% discount on a great holiday gift – contact them at MAHJONGGMENTOR.COM/THANKSGIVING – don’t forget to use THANKS2017 in the invite code. This entry was posted in Mah Jongg and Me and tagged Black Friday sale, mah jongg, mahjong, mentor on November 21, 2017 by Mah Jongg and Me.